"Thane" deepening astoundingly, and is a very severe cyclonic storm (IMD terminology) with a core pressure of 980 mb and surface winds roaring at 120 kmph, gusting to 140 kmph !Cat. 1 as per international standards. Now, tonite, in the next 12 hrs, there will be further intensification, with the pressure dropping further and winds raging to 140 kmph by tomorrow. Very intense convection resultant clouds are observed west of the storm right upto the centre. Cloud tops are very high and temperatures are at -86c. 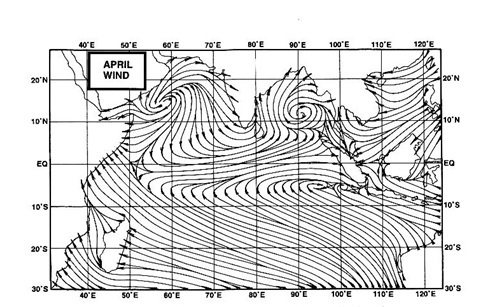 The pressure started droping from mid day today, Wednesday, and bottomed to 980 mb by 8.30 pm IST. 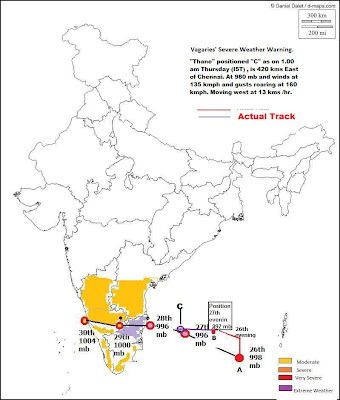 Chennai alert for high winds and gales from tonite.Cloudiness starts increasing rapidly, and coastal waves will be lashing at 22 feet. "Thane" deepens to 990 mb with gusty winds at 110 kmph.Currently (5 pm) at 500 kms west of Chennai. Gusty winds at 30-40 kmph from a Northerly direction to hit Chennai from tonite. Heavy clouding and wind speed gradually on the increase from tonite..
Report of 12.30 pm (IST) Wednesday. As the ridge deepens, "Thane" moves due west. Moved marginally west in last 6 hrs, and is 550 kms due west of Chennai. Convection increases in the SW quadrant. Clouds at phenomenal height, with top at -85c ! Pressure at 992, but winds raging at 100 kmph. Seas getting rough. 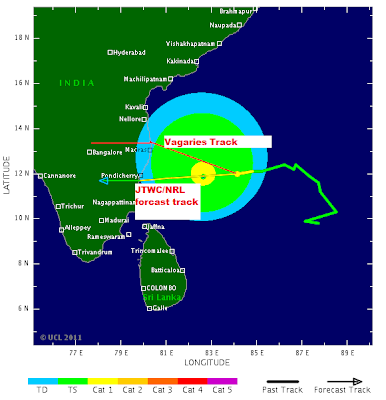 Could strike by Friday, slightly North of Chennai, possibly at current strength. The pressure hmmbas dropped below 980.Waiting for your update. 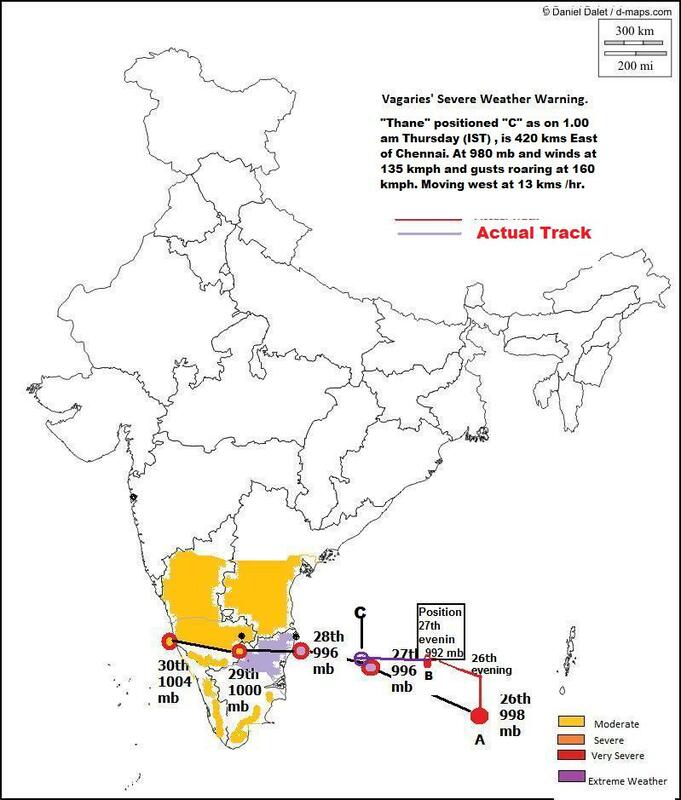 Will Very Severe Cyclone Thane beat all the above records so far it has registered 37 km/hr winds without even coming close to the coast.